EXODUS: GOD AND KINGS isn't a good or a bad film but rather a collection of films that may or may not hang together as a sweeping biblical epic of the Charlton Heston kind. It's long, uneven in pace, and takes too few chances to be really memorable. In its first act the movie feels like GLADIATOR. The dying king is transposed from a Roman emperor to a Pharaoh played with surprising majesty by John Turturro. His jealous, power-hungry and paranoid son is transposed from Joaquin Phoenix to a shaven-headed and bejewelled Joel Edgerton. And the rival for power who will lead a down-trodden people to freedom is transposed from Russell Crowe to Christian Bale. This section is the most satisfying of the film - literally awesome in its lavish costumes, Egyptian cityscapes, jewels and vistas. It feels like an old-fashioned big-budget epic of imperial power-politics, pitting two alpha males against each other. Ben Mendelsohn is superb as the effete toady who reveals Moses' Jewish origin to both Moses and Ramses and I love the genuine conflict as Moses struggles to come to terms with his true identity. The only sadness was seeing Sigourney Weaver as Ramses mother use an anachronistic broad American accent and then become sidelined for the rest of the film. The second act of the movie is, sadly, deeply dull. I like to think of it as the GODFATHER act, in which Michael Corleone is exiled to bumble-country and marries a peasant girl, except this time its Moses marrying Zipporah. He hangs out for nine years and, boy, does it feel like nine years, until he encounters God on a mountain top and heads off to Egypt to free his peeps. In the only creative moment of the film, God is portrayed by a small intense little boy. I rather liked this as I've always seen the Old Testament God as rather jealous and petulant. We then move into the third act of the film, which is basically a massive A-TEAM style montage as Moses tries to lead an insurgency against Ramses to force him to free the slaves. Evidently this doesn't work so we flip into LAKE PLACID as God unleashes the plagues, proving that he was the first horror movie director. Once again I found this pretty dull, especially as the CGI horror is so over-done it becomes surreal rather than genuinely horrifying. Moreover, for those of us who know our plagues, it became a bit like watching SCOTT PILGRIM where you start counting down the evil ex-boyfriends, thinking how many more have we got to sit through? With the plagues over and Ramses humbled, Moses leads his people out of Egypt to the shores of the Red Sea with a vengeful Ramses hot on their trail. I like the idea that Moses in this section is horrified by the lengths that God went to with the plagues and is literally lost without his guidance. It was the first time I felt the film was theologically and psychologically interesting, but before we can linger over it we're into the parting of the Red Sea. Except that Ridley Scott takes a more low-key approach showing the waters draining away as the Hebrews cross, before a giant tsunami is unleashed on Ramses at the end. And so to a rather rushed and bizarre denouement in which we have a cursory rapprochement with Mrs Moses, the writing of the ten commandments and an aged Moses riding with the Ark of the Covenant. It doesn't seem emotionally satisfying. 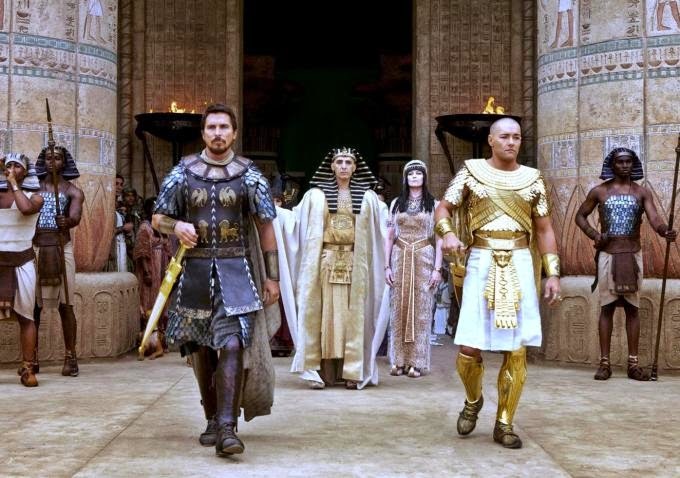 Surely, there should've been more of a final showdown with Ramses, as the opening act had made THAT seem like the significant relationship of the movie. And if it was so important for Moses to reunite with his wife, why not show her in the caravan. Ah well. I suspect that some of the multi-movie feel of EXODUS: GODS AND KINGS may be down to the many people who had a hand in writing the film. It looks like it started as a script by the guys behind the execrable TOWER HEIST by way of script doctors including Steve Zaillian (MONEYBALL). But not all of the problems of the movie can be laid at their door. Ridley Scott must've struggled to get this film down to two and a half hours but did we really need to completely excise the relationship between Moses and Joshua (Aaron Paul) and could we not have seen some more of Sigourney Weaver? And couldn't we have given poor Joel Edgerton something more to do except be two-dimensionally paranoid. I guess what I'm saying is that given all the money thrown at this - the lavish costumes and production design - and the superb casting - we should've gotten more from this movie. As it is, it's fine but pretty forgettable. EXODUS: GODS AND KINGS has a running time of 150 minutes and is rated PG-13. The movie is on release everywhere except Egypt, where it opens on New Year's Eve, Azerbaijan, Colombia, Costa Rica, Kazakhstan, New Zealand, Russia, Ukraine and Uruguay on January 1st, Ecuador on January 2nd, Bolivia and Peru on January 8th, Poland and Venezuela on January 9th, Italy on January 15th and Japan on January 30th.